Description:- Nexito 20 mg tablet is used in the treatment of depression, anxiety disorder, phobia, post traumatic stress disorder and obsessive-compulsive disorder. Nexito 20 mg tablet works by increasing the levels of serotonin, a chemical messenger in the brain. This improves mood and physical symptoms in depression and relieves symptoms of panic and obsessive disorders. Avoid consuming alcohol when taking the Escitalopram, as it may cause excessive drowsiness and calmness. The risk of dependence is minimal with the Escitalopram. The most common side effect seen with Escitalopram is nausea, vomiting followed by diarrhea. On long-term use, the patient might develop sexual side effects, but they are reversible. Do not discontinue or increase/decrease the dose without consulting the doctor. You may have to take Escitalopram at least for 2 to 3 weeks or longer before you begin to feel better. Notify your doctor if you feel unusually agitated, irritable, or have thoughts about hurting or killing yourself. 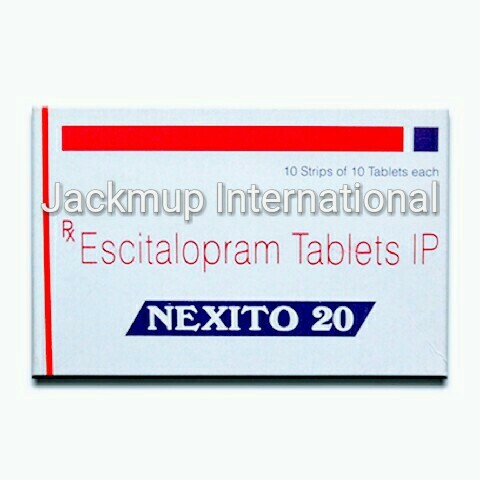 Escitalopram should be taken preferably during the day to keep the mood alleviated during the day. During the treatment initially signs of anxiety may be seen in some patients.